This Email Map, created by Christopher Baker, is a piece of custom designed software capable of rendering the relationships between Christopher and individuals in his address book by examining the TO:, FROM:, and CC: fields of every email in his email archive. The intensity of the relationship is determined by the intensity of the line. The tool allows one to explore different relational groupings and periods of time, revealing the temporal ebbs and flows in various relationships. In this way, this tool is a veritable self-portrait, a reflection of Christopher's associations and a way to locate himself at various points in history. As the author explains: "Email became an integral part of my life in 1998. Like many people, I have archived all of my email with the hope of someday revisiting my past. I am interested in revealing the innumerable relationships between me, my schoolmates, work-mates, friends and family. This could not readily be accomplished by reading each of my 60,000 emails one-by-one". This project can be viewed as a large scale static print (40"x40" archival inkjet) or as an up-to-date dynamic visualization. The interactive program is written in Java and uses Processsing, MySQL and various other libraries. The software includes a custom IMAP email client and a VCF address book parser, which enables the inclusion of VCard photos. This particular visualization strategy was influenced by similar circular relational structures such as CAIDA, SCHEMABALL, GNOM, etc. 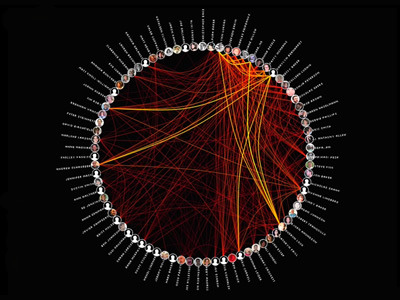 Much of my initial email visualization research was influenced and inspired by the work of Judith Donath's Sociable Media Group at MIT - particularly the work of Fernanda Viegas. I dont get it. where is christofer? shouldnÂ´t they all go to the same point, christofer? or it also shows the relations between the from, to and cc? Since all of the emails are from my personal archive, it is implied (but maybe not so obvious) that all of them are connected to me in some way. 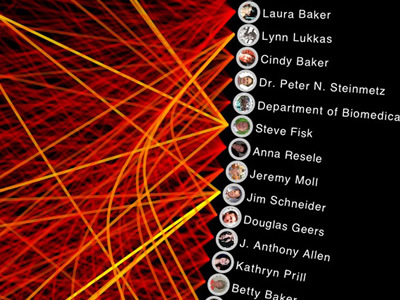 The lines that connect the people in this visualization simply indicate the "strength" of the relationships (or lack thereof) the people in my address book. These relationships are formed when one person sends an email to me AND a list of people already present in my address book. They do this by including these other people in the TO: and CC: fields. The "strength" of the implied relationship between me and my contacts are implied by the placement around the circle.